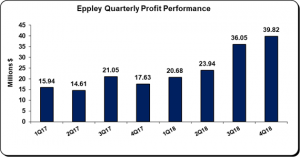 Eppley Limited (EPLY), audited results for the year ended December 31, 2018 reported interest income of $319.19 million a 22% or $57.78 million increase when compared $261.41 million recorded for the corresponding period in 2017. Total interest income for the quarter amounted to $84.77 million a 20% increase when compared to the $70.44 million recorded for the same quarter in 2017. Interest expenses for the period amounted to $170.15 million, a 7% increase when compared to $158.39 million recorded for the prior year. Consequently, net interest income for the financial year rose 45% to total $149.03 million up from the $103.01 million recorded in the corresponding period of 2017. Net interest income for the fourth quarter amounted to $42.20 million relative to $28.59 million in 2017. Other operating income for the period soared by 155% to total $93.93 million relative to $36.89 million booked for 2017. Administrative expenses rose 57% for the year to close at $137.94 million up from $87.90 million recorded the previous year. Eppley recorded a total of $17.16 million for share of net profit from joint venture accounted for using the equity method for the period relative to the $16.13 million recorded for the corresponding period in FY2017. Net impairment losses of financial and contracts assets amounted to 922,000 in 2018 versus nil in the prior year. As such, pre-tax profit closed at $121.26 million for the year ended December 31, 2018, 78% more than the $68.14 million booked in 2017. Taxation of $776,000 (2017’s tax credit:$1.08 million) was incurred for the period resulting in a net profit attributable to shareholders of $120.48 million, a 74% increase from the $69.23 million recorded for the same period in 2017. Net profit for the quarter amounted to $39.82 million, a 126% uptick when compared with the $17.63 million recorded for the last quarter in 2017. Earnings per share for the quarter amounted to $0.21 (2017: $0.09). Earnings per share for the year ended December 31, 2018 totalled $0.63 compared to $0.36 for the corresponding period in 2017. The total amount of shares outstanding used for this calculation was 192,468,300 units. Notably, the stock price for EPLY closed the trading period on March 29, 2018 at JMD $ 10.57. As at December 31, 2018, total assets amounted to $3.29 billion, relative to the $2.45 million recorded a year ago. The increase in assets was driven primarily by increases in ‘Loans receivables’ by $327.88 million to close at $1.47 billion (2017: $1.14 billion) and ‘Financial Assets at fair value through profit’ by $363.76 million from nil in 2017. Shareholder’s Equity as at December 31, 2018 totalled $774.88 million (2017: $708.33 million) resulting in a book value per share of approximately $4.03 relative to $3.68 in 2017.